I joined Facebook about 9 years ago. My twins were one-year-olds at the time and I really enjoyed being able to connect with old friends, family members, and I loved adding new friends to my list of contacts as well. Even though it was really nice for me to have that outlet, since I was home a lot with my boys, there was a certain amount of anxiety attached to it as well. I needed to post pictures. All the pictures. And I needed to make sure that I looked glowing and happy, whenever I did. I also enjoyed posting photos of my husband and the boys – and adding (what I thought) were clever captions. Actually, our twins still like looking through some of those old Facebook albums I created and reading what I wrote about them. So yeah, there was the anxiety of making sure I posted all our best pictures and every single fun thing we did, but there were other worries as well. Who liked my post – and who didn’t. Who commented and what did they mean by that comment? Should I friend or not friend someone? Like, for example, someone in high school that barely even acknowledged I existed. What if someone contacted me that I really did NOT want to connect with. Should I accept so I don’t hurt their feelings? What if I tried to connect with someone who didn’t want to connect with me? The thought of rejection was suffocating at times. How many friends do I have? Did someone unfriend me? Was it something I said or posted? I could go on and on but these are some of the initial things that caused anxiety. Because of these irrational fears, I was quite reluctant to post anything that would be too controversial or go against the LOUD majority. Fast forward to today — I am not as concerned with what I post but I still try not to post anything that I think will start a big debate on my wall. When I first joined Facebook people were sharing photos, talking about places they visited, took pictures of things they ate, and basically told everyone what they were doing, where they were doing it and when they were doing it. I was one of those people. Maybe not posting ALL the time but usually 3-4 times a day. Now, it is unusual if I even post that much per month! Over the past several years, however, I have seen more and more people use Facebook as their soapbox. Posting their opinions, news stories, & political views. It was really bothering me to see people that I have known for a long time, spouting off hateful words, belittling others, and making generalized statements about others they disagree with. My Fortitude as it relates to my Facebooking (not sure if that’s a word but you know what I mean), has grown leaps and bounds. If you look at my page you will see my cover photo almost always has a scripture or something else that tells everyone I am a Christian/Catholic. I am not longer afraid to share saint quotes or scripture verses on my timeline. I make these public so anyone who wants to request my friendship knows that I am a Christian and not ashamed to proclaim that. I also “like” a lot of Catholic related pages. This is for two reasons, it puts good things in my new feed. Things I want to see and things that nourish my spirituality and help me grow in faith. It is also my hope that people I am friends with will, see these pages and like them as well. Another thing that I do, is like and comment on posts that don’t necessarily have the courage to share on my timeline, but I hope and pray will end up in the new feeds of people who need to see or read these things. I do this a LOT with pro-life articles and other issues that are important to me. I had to have the courage to let go of some toxic “friendships”. These are people who consistently post hurtful comments or posts that make me feel sad/mad. I do have some friends who I adore in real life but cannot stand on Facebook! These people I am referring to used to post pictures of their kids, places they visited, shared life experiences, etc. but now 95% (that is not an exaggeration in most cases) is not only contrary to what I believe but also fuels the fires that are dividing people. Look, I appreciate that people have their own opinions. I also don’t mind if people post articles about things they feel strongly about even if it goes against everything I believe – but when that is all I see and it makes me feel hurt and anger toward that person, I just have to step away. I don’t have it in me right now to argue my point with them on Facebook. I am worried it will damage our relationship. It also doesn’t seem right to me, to hash these things out with friends and family on social media, hiding behind a screen and not look the person in the eye. I would much rather discuss important issues like this in person, not online with who knows how many people watching and ready to “jump” me for sharing my perspective. Here’s the crazy thing, when we meet face-to-face, these friends are nothing like their Facebook persona. They are very respectful of my beliefs and never bring up anything close to what they post; lies and misconceptions targeting not only religion but the Catholic Church. So what to do? If I “unfriend” them I would hurt their feelings and it could be awkward when we do interact. I have decided that for me, it is in everyone’s best interest to “unfollow” them. We remain friends but I don’t see what they post unless I go to their page and check. This has restored my peace. Also, I have some friends who regularly post things I like to see but once in a awhile they will post things from a page I do not want to see. In these cases I hide that page. So they can share articles from that page all they want, but I will never see them! YAY! Filtering out anything that steals my joy or makes me anxious and/or angry. Hide people who I want to remain friends with (this could be friends or family members) but I don’t want to constantly see their posts. Be selective about the pages I “like”. Follow pages and people who nourish my soul and help me grow in faith. I am selective about who I am friends with. If I haven’t actually talked to a person face-to-face in many years and they post hateful and/or hurtful things, I unfriend them. I enjoy posting things that reflect my faith and love of the Lord. I grow stronger and stronger everyday. 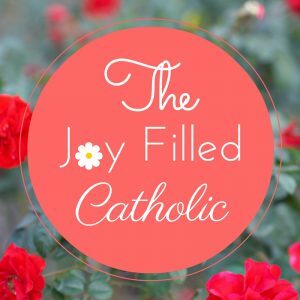 In an effort to share my faith, hope and love, I set up my Joy Filled Catholic Facebook page, Instagram, and Twitter Accounts and post on them regularly. I also have this blog, which has taken copious amounts fortitude to even push publish on the posts that I write – and to share them on my social media accounts. Now, confession time! I have never posted any of this information or shared any of my posts on my personal FB page. I have not even mentioned The Joy Filled Catholic to very many people. I also have not shared my blog with anyone I know. Where is the Fortitude? Where is my holy courage? That my dear readers, is what I’ll be working on during the To Jesus Sincerely Virtue Challenge this month. It isn’t too late to join! We can grow together in Fortitude this month. If you want to learn more and download the printables for the month check out the post: Have Courage and Do the Right Thing you’ll find all the details there! Next Post Let Us Love and Encourage One Another! Awesome post! Facebook is often a very distressing animal. Your bullet point summary is excellent. Thank you for visiting and taking the time to read and comment. Have a blessed day!